Chocolate….Did I ever tell you how much I love it? Yep, I think I did…many times, in fact! 🙂 If not, you could probably guess that chocolate is on my mind often by how many posts have included a recipe containing this treat! 🙂 I promise you, though…other “food groups” are in my kitchen, and I have a couple delicious side dishes to post soon, ones that are sure to be a hit at your pot lucks this summer. But today, yes. We are going to indulge in little chocolate once again. This recipe is absolutely divine. Did you see the name of this recipe post?! I am not kidding. I could quite possibly eat the whole pan myself if I didn’t have several friends with whom I could share this treat! They are naturally sweetened with nutrient packed dates and pure maple syrup and loaded with healthy fats! Plus, they are easy to make! What could be better than that? I am grateful to Katie from Chocolate Covered Katie for the original recipe. I did make some minor changes, but the recipe is very similar to hers. Check out her recipe post here. If you can, stay and visit for a while too. 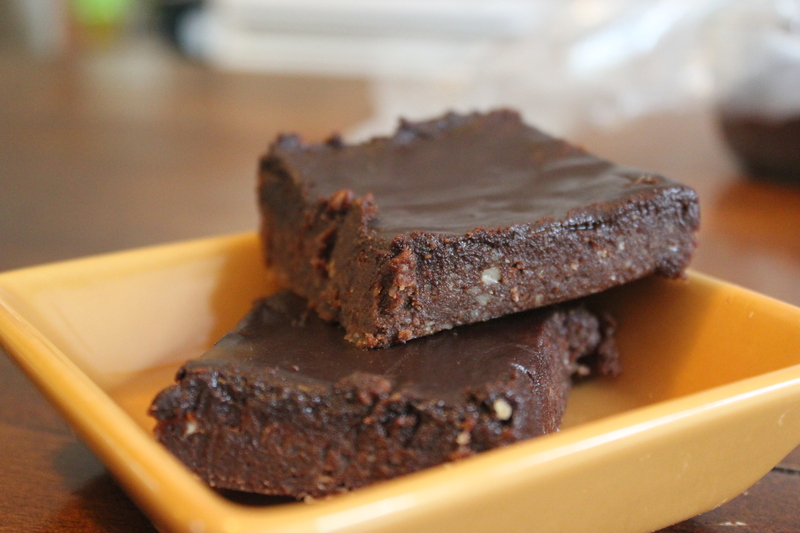 Her blog is absolutely amazing and is filled with an abundance of excellent, healthy desserts. Thanks, Katie! 1 teaspoon pure maple syrup (Grade B is preferred, but Grade A is completely fine too!) If you want to use raw honey, that is another option. 1. Grease an 8×8 pan and set aside. 2. Place the first seven ingredients in a food processor and process until it is well mixed. You will need to stop the food processor a few times to scrape down the sides. Note also that it may seem to be dry initially, but it will come together. Adding more liquid will make it more sticky and more difficult to work with later. When it is mixed, scoop out the mixture and spread it into your pan. Set aside. *Thank you to Katie from Chocolate Covered Katie for the original recipe.